Karymsky (Kamchatka): Explosions with ash emissions detected on satellite images have been more frequent lately. Yesterday, VAAC Tokyo reports an ash plume at 14,000 ft (4.2 km) altitude drifting north from the volcano. Suwanose-jima (Ryukyu Islands): The volcano's activity seems to have increased since around 30 July. On Saturday 1 Aug, explosions had produced an ash plume that was visible on satellite images (VAAC Tokyo). Incandescence is not visible on webcam images, but this is probably due to dust/mist/ash covering the lens. Manam (Papua New Guinea): It seems that no fatalities have occurred during the large explosion on Friday (31 July). According to news articles, only one child was injured by falling lapilli, but survived and could be treated in a hospital. Up to 2 cm of ash has been deposited over most of the island, destroying or damaging much farmland, many houses and contaminating water sources. Respiratory problems are a major concern in the aftermath of the eruption, which, however, could easily have had a much worse outcome. There are no reports of evacuations of people from the island (as occurred in 2004, when a similar, although even larger explosion occurred, killing several people and prompting more than 9000 people to be evacuated). 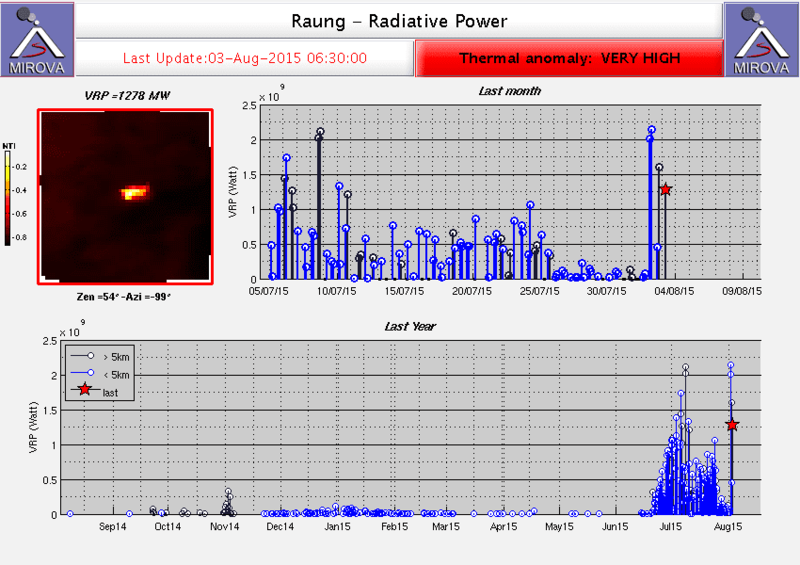 Raung (East Java): The eruption continues. Ash emissions have decreased, while satellite-detected heat emission increased during the past days. This could suggest that activity is now more effusive (lava flows) than explosive (ash emissions) in style. This morning, an ash plume rose approx. 1 km above the volcano and drifted 100 km to the SW. Indonesia's Volcanological Survey VSI mentioned yesterday that seismic activity rapidly decreased. Whether this means a near ending of the eruption remains to be seen. Dukono (Halmahera): The volcano continues to erupt near constant ash plumes from small to moderate, but nearly continuous explosions from the vents inside its crater. Yesterday, VAAC Darwin reported ash at 7,000 ft (2.1 km) altitude extending almost 100 km to the northeast. Piton de la Fournaise (La Réunion): After less than 3 days, the eruption already ended Sunday morning. The volcano observatory reported that tremor and lava effusion ceased abruptly at 11:15. However, a new eruptive phase in the near future cannot be ruled out. The access to the Enclos remains closed. Attached is a series of photos, taken on the first evening of the eruption by local resident Paul Dérand (thank you! ).